The Gryphon imagers 4100-HC series are specially designed for use in healthcare and in sensitive areas such as the food and chemical industries. The disinfectant-resistant housing is equipped with anti-microbial additives and thus are able to be treated with aggressive cleaners. This series offers all the benefits and product features of the standard Gryphon scanners. An extremely fast scanning of 1D and GS1 barcodes, even from a very far distance is ensured thanks to the powerful scan engine. A generous motion tolerance, targeting function and Datalogics patented Green Spot ensure intuitive operation and high productivity. Depending on the area choose between a wired model, a radio version and the version with Bluetooth technology. The mobile versions impress with greater flexibility, a 30 m range and the storage of 1,200 codes in batch mode. Of course, thanks to the multi-interface you have all the standard interfaces available in a single device, which makes the connection to existing systems even easier for you. 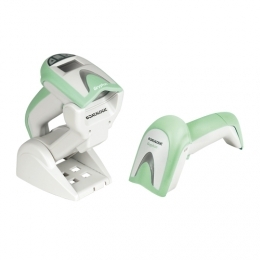 Just like the standard versions of the Gryphon I the 4100 healthcare variants also read all common 1D barcodes with up to 325 reads per second. The maximum reading distance on 13 mil EAN-13 label is an accommodating 60 cm. This provides significant productivity gains in many situations and also for improved ergonomics. Thanks to the large scan angle of 42 you also capture wide codes without problems. With a special matching function, increase hospital patient safety, for example, with the administration of medication. With the Gryphon you are able to temporarily store a barcode and compare it with another barcode. If, for example, the value stored in barcode 1 in the patients record matches what is printed on the medicine in barcode 2, the Green Spot directly shows the scan confirmation on the barcode. This effectively minimizes the risk of confusion of patients and medications.